My neighbors wanted to throw away a perfectly good PC with Windows 10. But instead I installed Ubuntu MATE giving the PC a new life and didn’t let it become ewaste. When I came home the other day my neighbors were loading electronics on their bicycles (I live in the Netherlands you know) to dispose of them. Among all the stuff was a desktop computer that looked in pretty good shape. It was a Packard Bell iMedia S1800. I informed why they would dispose of the PC and they told me that according to their daughter it had become unusable. They are very nice people so I asked them if I could have the PC. They agreed to it and I took the desktop with me. Back home I took another look at the computer and it was even nicer than I expected. It didn’t have a scratch and when I opened it it looked clean. That night I booted the PC and quickly found out it had Windows 10 running. The PC was slow as molasses and it was very noisy. I felt I had already found the cause of the daughter complaining, Windows 10. I had no intention to run Windows so I took out my Puppy Linux disk (Xenial Pup 7.5) and rebooted the PC. The difference couldn’t have been greater. Puppy Linux booted fast and ran even faster. I got the idea to make this a general purpose workstation that, if goes well, can replace my iMac. How much I love Puppy Linux I don’t think it’s suitable for my purpose. Besides all the usual tasks I use my iMac for light 3D CAD work (for 3D printing), web design and video editing. I also like to have access to a broad software repository because I like to test new software and to replace the workflow I have on the Mac. In this department Puppy Linux can be lacking due to the Puppy Package Manager which differs from the mainstream package managers. I therefore decided to give Ubuntu MATE 18.04 LTS (Bionic Beaver) a spin. My son already runs Ubuntu so I’m familiar with it and the MATE desktop is relatively lightweight (Gnome 2). Installation from a USB drive went flawless (overwriting W10 in the process). The desktop looks very clean and the software suite is great. I can add software through the new Software Boutique and if it isn’t there I have access to the Ubuntu repository (through apt). For a full review of MATE 18.04, read this. So here I am. A nice Packard Bell is sitting on my desk instead of having become e-waste. If you read this don’t throw away your old PC because Windows 10 made the experience a nightmare. Install Ubuntu MATE or any other Linux distro you like and enjoy. In the mean time you’ll be doing the environment a favour. Cheers. 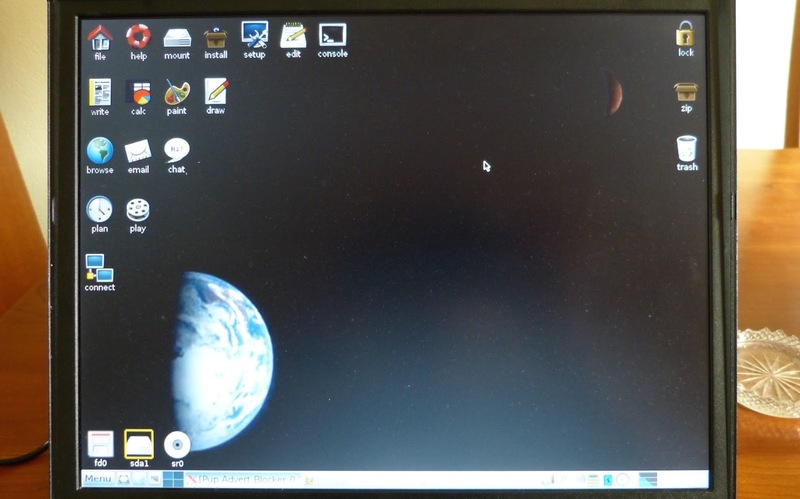 In November last year I decided to revive my very old (2003) Thinkpad T40 with Puppy Linux. Now eight months later I’ll give an update on Puppy Linux on my PC. Am I still happy with Puppy Linux? 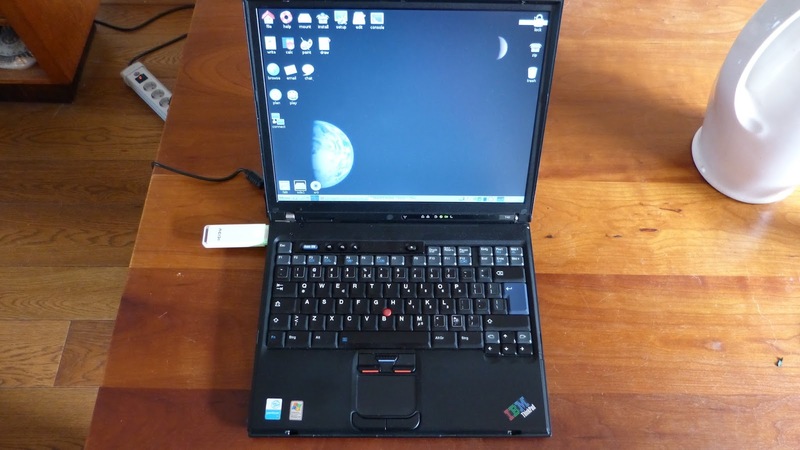 In November last year I decided to revive my very old (2003) Thinkpad T40 with Puppy Linux. Back then I was thrilled by the ease of installation and the speed of this Linux distro on this ancient laptop. Now eight months later I’ll give an update on Puppy Linux on my PC. Am I still happy with Puppy Linux? Both Puppy Linux Slacko 5.7, which I had installed initially, and Puppy Linux Slacko 6.3 have been very stable on my T40 and I loved Puppy Linux because of it’s speed. However both of these Slacko distributions are based on Slackware. The one problem with this distributions is the lack of software. Some programs that I needed are just not available in the repositories. I could install software myself but only if I was able to find the right pet or sfs file (I cowardly didn’t try to compile the source files). The standard TahrPup desktop with the beautiful stylized Ardis icons. To solve the problem with the software I decided to install Puppy Linux Tahrpup 6.0. This operating system is based on Ubuntu 14.04 Trusty Tahr. I liked it the minute I installed it. The look and feel are the same as with Slacko with the JWM as window manager and ROX-Filer file manager and all the helpful shell scripts (a lot of them written by Barry Kauler, the original creator of Puppy Linux). Also a lot of the pre-installed programs are the same such as Abiword, Geany and pfind, a file finding program MtPaint and Sylpheed, a mail client. The’re also notable differences. The default browser for Tahrpup is Palemoon instead of Firefox and the Simple Screen Recorder (I forgot the name of the default Slacko screen recorder but I never got it to work). The system is still very fast, exactly the reason why I chose for Puppy Linux in the first place. Puppy Linux (and Linux in general) not only let’s you create your own desktop environment, where just about everything is customizable, it even let’s you customize the whole operating system. If you, for instance, don’t like the window manager or the file manager, you can change it. Try doing that on Windows or OSX. This way you can create your very own system doing honor to the acronym PC. TahrPup even has an option to easily change the Linux kernel, something that I couldn’t do with Slacko. With Remaster Puppy live-CD a copy of the personalized operating system can be written to either a USB drive or CD. For the latter a CD burner is needed of course. This copy of the personal operating system with all the favorite programs can be used to boot on any PC elsewhere e.g. on holiday or in school. On the Puppy Linux discussion forum many examples can be found of unofficial Puppy Linux distros such as Tahr NOP (Xfce desktop environment), Ami-Pup (an Amiga like interface) or Fatdog64 (a not so slim 64bit version). Even with little experience in programming, additions can be made to the operating system using shell scripts. In fact plenty of programs that come with Puppy Linux are shell scripts. Pfind and pmount are good examples of this. Although this is not for beginners, shell scripts are relatively easy to write. An intermediate user should be able to improve existing scripts or write new ones. A script can be shared on the Puppy Linux forum as a contribution to the operating system and the community. This is a good start for programming for Puppy Linux. It’s also possible to use C or C++ as programming language for Puppy Linux but this is more complex and outside the scope of this blog entry. A good starting point for programming for Puppy Linux is this link. Puppy Linux with the setup shell script opened in Geany. Programming in Puppy Linux is easy using shell scripting and GTKDialog. The only drawback so far is that the new Puppy Package Manager v2 (PPM) seems a bit slower on my old laptop than with Slacko. PPM is the equivalent of the Ubuntu Software Center or Pacman for Arch Linux and provides access to the repository with all the available packages for Puppy Linux. The numerous packages in Tahrpup are possibly the reason for this slower behaviour. Eight months later my Thinkpad T40 is still very much alive thanks to Puppy Linux. With Tahrpup I gained easy access to a huge amount of programs satisfying my increasing PC needs. The best feature about Puppy Linux (and Linux in general) is that it feels like my very own operating system. It’s easy to get involved into Puppy Linux thanks to it’s open nature and the vivid community. A feeling that I’m severely missing in the proprietary OSX on my iMac, my primary computer. In fact, if not for my wife who is still attached to the iMac and OSX, I would exchange my iMac for a (Puppy) Linux PC without hesitation. My T40 with Tahrpup background image and the JQBrased icons. In my previous blog post I finished my audio cooler. It’s a small cooler with a tiny audio system that nevertheless sounds good. The only way to control the audio is through a wired connection. It would be a nice addition to have some kind of remote control either by WiFi or Bluetooth. While testing the cooler I’ve got the idea to connect a Raspberry Pi A+, that was still unused, to the cooler and stream audio over WiFi to the Pi. This could be useful for a garden party or BBQ where WiFi is available and I don’t want to attach the smartphone to the cooler. In this blog post I’ll share my experience with installation and operating the software needed for this project on the Pi. Raspberry Pi A+ (in it’s Pimoroni Pibow case) connected with the headphone jack to the cooler. The Pi has a small Edimax Wifi adapter. The burglar that “visited” our house a couple of weeks ago took our laptops and tablets. Luckily our desktops were left alone (probably to heavy). Also a very old IBM Thinkpad T40 was left behind. The burglar probably thought it didn’t have any value. That was a bit of luck for me because with a little effort this 12 year old laptop is still very usable. After all these years the only thing that failed in this laptop was the battery. Everything else is still in excellent condition. These Thinkpads were (are?) very sturdy. On top of that they are very modular. Almost every component is easy accessible with just a screw driver. Very different from modern laptops that are almost impossible to open without special equipment. 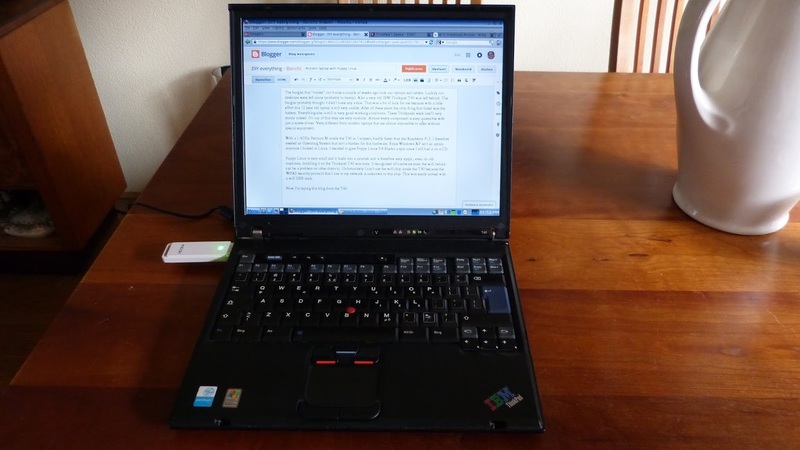 The twelve years old IBM Thinkpad T40. Is it worth reviving it? With a 1.4GHz Pentium M inside the T40 is, I suspect, hardly faster than the Raspberry Pi 2. I therefore needed an Operating System that isn’t a burden for this hardware. Since Windows XP isn’t an option anymore I looked at Linux and decided to give Puppy Linux 5.7 Slacko a spin. Puppy Linux is very small and it loads into the ramdisk and is therefore very zippy , even on old machines. Installing it on the Thinkpad T40 was easy. It recognized all hardware even the wifi (which can be a problem with other distro’s). Unfortunately I can’t use the wifi chip inside the T40 because the WPA2 security protocol that I use in my network is unknown to this chip. This was easily solved with a wifi USB-stick. Now I’m typing this blog from the T40. Firefox (version 17 ESR) works fine. I can access Google+, Youtube and other sites without problems although the rendering of some sites isn’t perfect. With Geany I can create html/css pages and code Python. Wordprocessing is done with Abiword and spreadsheets with Gnumeric. Do I want my laptops and tablets back? Of course but in the mean time I thank Barry Kauler and Co for this wonderful distro. Puppy Linux Slacko 5.7 runs fine on this very old laptop. Typing my blog on the T40 without a problem. Last week I wrote about the Raspberry Pi, the camera module and Motion acting as a surveillance camera. I’ve been testing my Raspberry Pi surveillance camera for a week now and the results are satisfying although there are also some problems. I think much of the succes of the camera comes down to finding the best settings of the /etc/motion.conf file of Motion for a given scenario. The motion.conf file enables you to setup the Motion program. Everything from camera settings to motion detection can be changed in this file. Image from a motion video. If someone (in this case my son) is entering our backyard it is perfectly recorded by Motion. I want my surveillance camera to record anyone entering my backyard but this sounds easier than it is. If the threshold parameter in motion.conf is too low all kinds of events are recorded that are completely irrelevant. E.g. on a rainy day raindrops falling on the window are recorded. With higher threshold values I might miss something relevant. After experimenting with different values of the threshold I found that a value of 1500 works best in my case. On a sunny day bright sunlight can fall onto the camera lens causing lens flare. This reduced contrast and color saturation (see image below). More importantly the Motion program detect changes in lens flare as motion and records them. I think problem can easily be solved with some kind of lens hood. Lens flare caused by sunlight reducing contrast and color saturation. A whole different problem is motion detection at night. My camera, the regular Raspberry Pi camera module, is just not up to this task. For detection at night I’ll need the NoIR Pi camera. This camera has no infrared filter. As a consequence colours at daylight look odd but you’re able to record at night, but only with infrared light illuminating the subjects. Several add-on boards for the NoIR Pi camera are on the market that do just that. These boards fit right over the camera module. The regular Raspberry Pi camera module is useless at night. Whenever I want to check the motion files (e.g after one day) I copy them to my iMac using scp from the OSX terminal and then created a playlist in VLC by dragging all the files into it. The harvest of that one day is then displayed. Next I’ll test the surveillance camera further until I’m satisfied with the settings and build a proper housing for the camera. Possibly I will switch from the regular camera module to the NoIR camera.